India Pistons won the V.A. Parthasarathy memorial tournament for the first time following an 81-run victory over MRF(Globe Trotters) in the final at the M.A. Chidambaram Stadium, Chennai on 13th February 2014. India Pistons team led by skipper Ganapathi Chandrasekar reduced the MRF Globe Trotters to a minimal score of 145 in 40.2 overs. Opener Vidyut Sivaramakrishnan won the man-of-the-match award, helped Pistons post 226 after they were invited to bat by Trotters. Our team showcased exemplary fielding on the pitch. 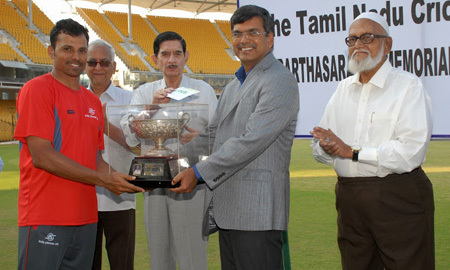 Skipper Ganapathi Chandrasekar ensured a quick finish by swiftly wiping out the trotters lower order.